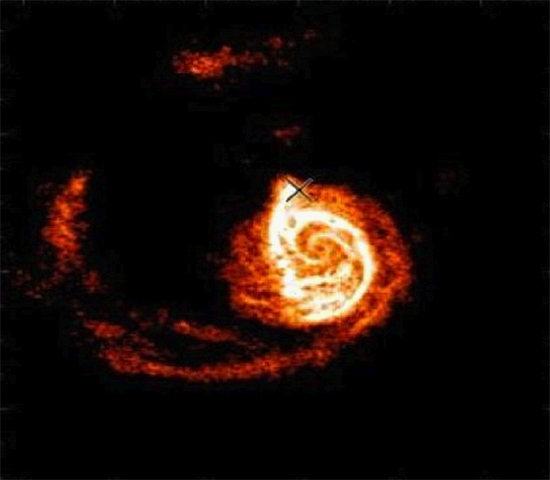 H1 Hydrogen emissions in the M51 galaxy. Sometimes, clues can be hidden in plain site. The key to solving a particular puzzle might simply be clouded by a layer of presumptions that obscure its true import. Such appears to be the case according a recent press release announcing the creation of a computer model to predict the existence of satellite galaxies. 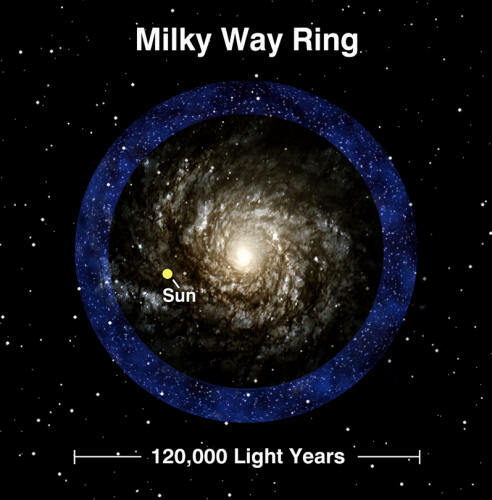 Astronomers from the University of California, Berkeley propose that galaxies like our own Milky Way should have "lots" of smaller galaxies in orbit around them. Since their existence cannot be determined by visible light surveys, it is thought that most of them are composed of so-called "dark matter." The research team developed a predictive computer model that analyzes H1 hydrogen distribution in galactic discs. If they can find disturbances in the structure it might indicate gravitational perturbations ("tidal effects") caused by invisible galaxies. The Milky Way is host to at least two smaller companions, the Large and Small Magellanic Clouds. However, some astronomers suspect that there are as many as 80 or more. The new predictive model is supposed to help answer the question. Gravitational force exerted by this unseen and undetectable material is thought to sustain not just our galaxy, but all galaxies. The supposed lack of luminous matter that can be observed in the visible Universe led to the original theory of dark matter. 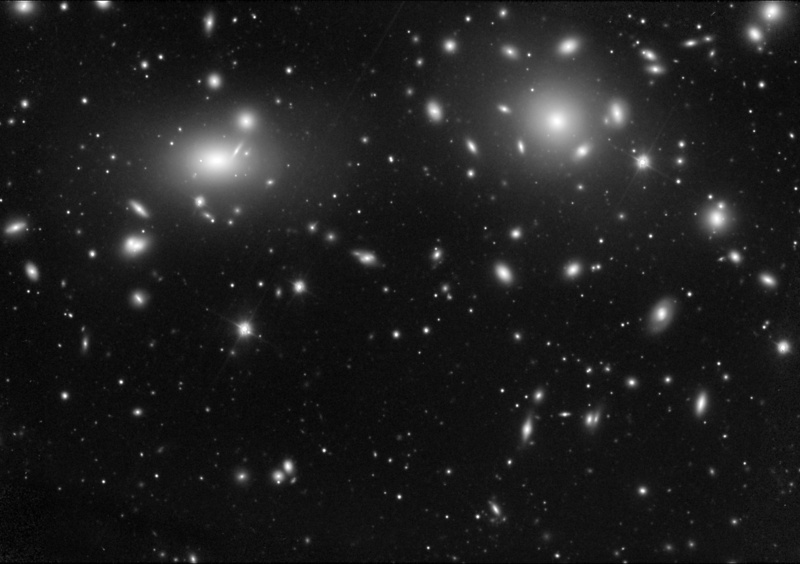 In 1933, Fritz Zwicky was studying the Coma Cluster (above image) and found that his calculations for orbital acceleration and stellar mass were off by a factor of about 160. He concluded that there must be something invisible to his instruments somewhere within the cluster that was holding it together. Dark matter is unseen and undetectable and can be analyzed through inference alone. Could it be that something else is taking place? Something that mainstream observers fail to consider as an active force? Electric Universe theory sees clusters of galaxies, the galaxies themselves, and their associated stars driven by electric currents flowing in dusty plasma. Birkeland currents create z-pinch compression zones between spinning magnetic fields in an electrical vortex. Compressed plasma forms electromagnetically confined spheres, some in arc mode, some in glow mode and some with variability between the two states. Cosmic Birkeland currents flow into galaxies, so stars in their discs are powered by those currents. Galaxies, in turn, receive their power from intergalactic Birkeland currents that are detected by radio astronomers in space as filamentary structures traceable by their magnetic fields. Birkeland currents are drawn toward each other in a linear relationship, with a long-range electric force attraction 39 orders of magnitude greater than gravity, although their magnetic attraction is weaker. Dark matter and dark energy influences can be dismissed when electric currents flowing through plasma are recognized. When Birkeland currents interact, they twist around one another, forming a helix. If a cross section could be taken through plasma trapped in their interstices, it would reveal the familiar barred-spiral shape of a galaxy. In the image of M51 at the top of the page, the intertwining electrical filaments are clearly visible. As Hannes Alfvén postulated, electricity flows into the poles of a galaxy like the Milky Way and then out through the spiral arms. The circuit closes above and below the galactic disk, flowing back into the poles. This circuit receives its driving power from Birkeland currents that connect the galaxy with the rest of the Universe. The galactic z-pinch forms a cylindrical particle beam, coaxial with the galaxy and beyond the edge of the disk, which would energize a ring of stars. Observations from the Sloan Digital Sky Survey have uncovered such a ring (above image), a separate structure that surrounds the galaxy at a reported distance of 120,000 light years. Instead of dark matter dwarf companions, the Milky Way and other galaxies most likely have dark mode electrically energized satellites.